From a distance, Route 3 looks like any other busy highway in Rhode Island as thousands of cars and trucks use it daily to make their way through the town of Coventry. But a closer look shows a raised asphalt divider between the turn lane onto Reservoir Road and the northbound travel lanes. The 25-foot-long elevation of the road isn’t intentional. Hundreds of trucks turn onto Reservoir Road from Route 3 every day – some going to an asphalt plant, others loaded with logs going to and from a tree service business. And there also are school buses that go to and from Coventry High. 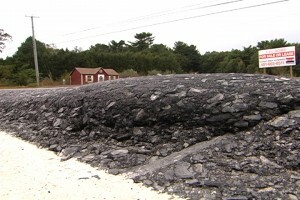 Assalone says the Rhode Island Department of Transportation has tried unsuccessfully to fix the road several times. Assalone: It’s the same people who put down the same asphalt every year, and all of the roads are screwed up. Hummel: How quickly does it bubble up? Assalone: Almost immediately. The first summer that it’s there. As soon as they fix it. If they fix it in the spring, by the summer it starts. So Assalone launched a campaign to get it fixed correctly. Assalone: I sent a scathing letter to the director asking him what kind of a department he runs that they don’t know how to fix something, with all of the engineers and all the money it has. In my opinion, there’s going to be a serious accident. Hummel: What did you hear back? Assalone: The first thing I heard was that if it’s overloaded trucks, it’s not their problem. Call the state police. Imagine that kind of an answer – if they know it’s from overloaded trucks, then I would think they would call the state police. Hummel: This is a state road that probably should be able to handle whatever you throw at it. Is that right? Smith: That’s right. This is kind of a unique situation the way this intersection lays out. You can go down the same road at other intersections and you don’t see the same kind of rutting and shoving of pavement. Smith says the work will be finished sometime this month. Assalone says he’s glad the state is taking a fresh look at the problem and getting to it before the winter plowing season, but isn’t convinced this will be the right fix. “If you keep doing the same thing with the same results, you’re nuts,” he said. The Hummel Report is a 501 3C non-profit organization that relies, in part, on your donations. If you have a story idea or want make a donation to the Hummel Report, go to hummelreport.org. Or mail Jim directly at jim@hummelreport.org. Next post: Fa-la-la la-la la-la-la Beer!